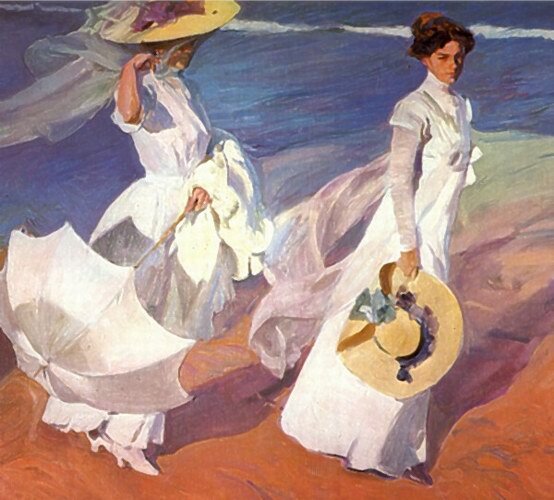 Joaquin Sorolla (1863 - 1923) was a gifted and prolific Spanish painter born in Valencia. He studied art education locally and then under a series of influential teachers. 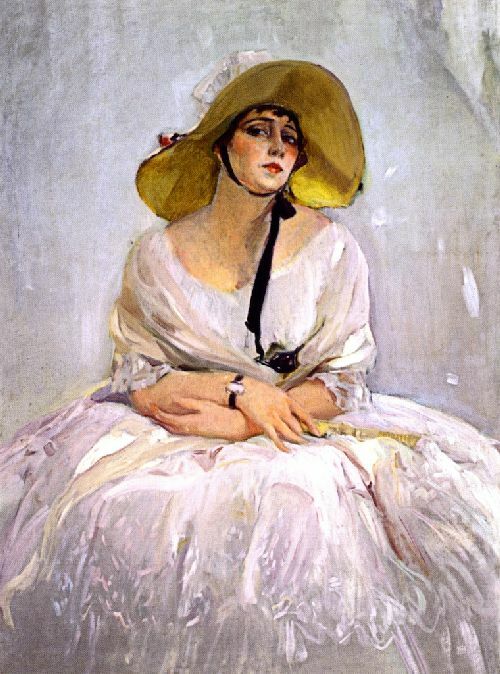 At eighteen he traveled to Madrid to study the master paintings at the Museo del Prado. Later, after military service, Sorolla obtained a grant to study painting in Rome at the Spanish Academy. 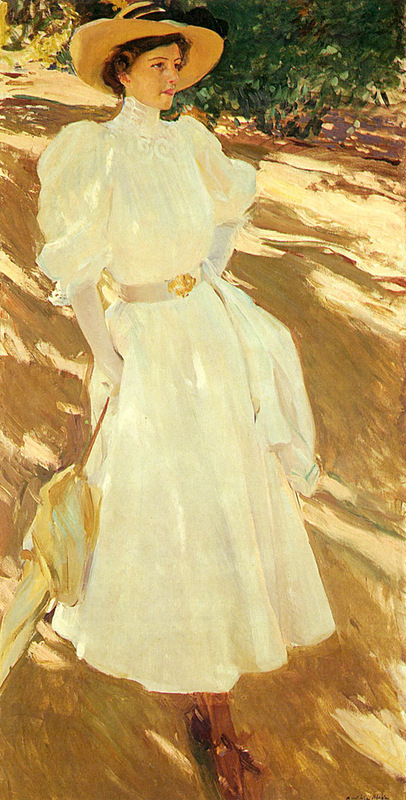 A stay in Paris in 1885 exposed him to the influence of artists and paintings of the modern age. 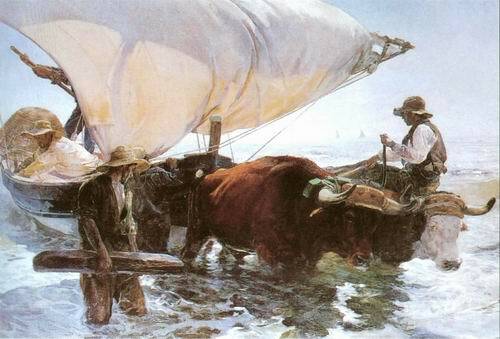 Sorolla continued study in Rome, then returned to Valencia where he married and began to raise a family - all the while painting huge canvases of Orientalist, mythological, historical and social themes. 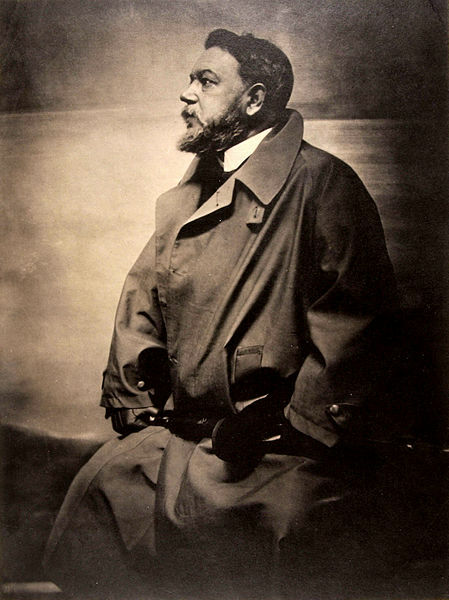 After many initial successes and recognition in his own country, an exhibit at the Paris Universal Exposition of 1900 won him a medal of honor and nomination as Knight of the Legion of Honor. Many other awards and honors followed. He also traveled to America where he spent several months painting portraits and earning more success. 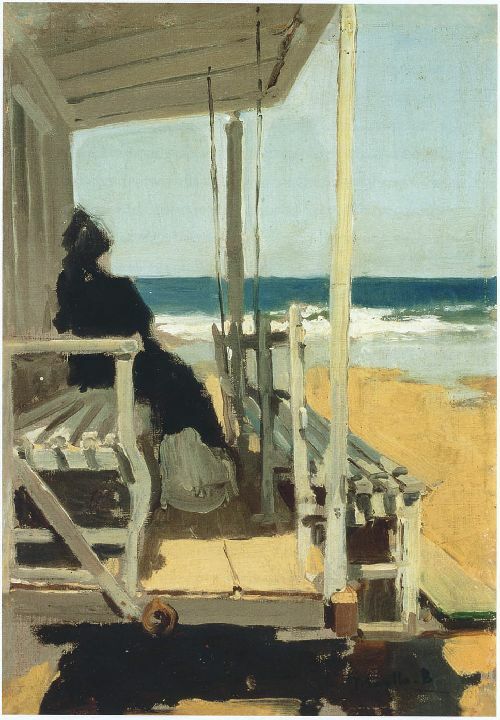 J. Paul Getty purchased ten of Sorolla's beach scenes, some of which are in the Getty Museum. For an artist this successful in his lifetime, it's amazing to me that I wasn't at all familiar with his work until very recently. His canvases are on exhibition in many of the world's top museums and in 2007, Sorolla's work was exhibited alongside that of John Singer Sargent, another artist (much better known) of that age who created his own niche and recognizable style. 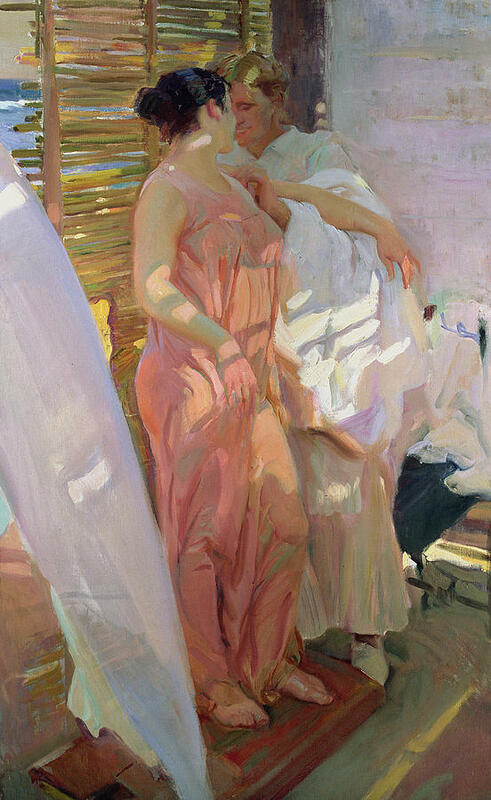 Just this year, a few of Sorolla's paintings were on exhibit at the Queen Sofia Spanish Institute in New York. "By reason of his native genius and stubborn will-power he became what he is - the painter of vibrating sunshine without equal. Let there be no mincing of comparisons in this assertion. Not Turner, not Monet, painted so directly blinding shafts of sunlight as has this Spaniard." To view more of Sorolla's work, please use this link and/or this one. Disclaimer: I've culled the items in this post from various online sites. I make no claim on copyright nor do I intend making any profit from the showing of these paintings. it is rather surprising that Sorolla's work is not better known for his subjects are most appealing and he clearly does stand alongside many of the more famous painters of the period. Indeed, in the examples which you show here of his work, it is easy to recognize the influence of the French school of the very early twentieth century. A most interesting and beautifully presented, and illustrated, post for which thank you. Yvette, I was unaware of this talented painter, so thanks for the education! I enjoyed all his paintings, especially "Promenade on the Beach" (which has a slight Renoir quality about it...perhaps it's the subjects). Absolutely stunning! Love this artist's work. Sadly, I hadn't heard of him, but now I have. Love the fisherwomen, Pescadores and others. 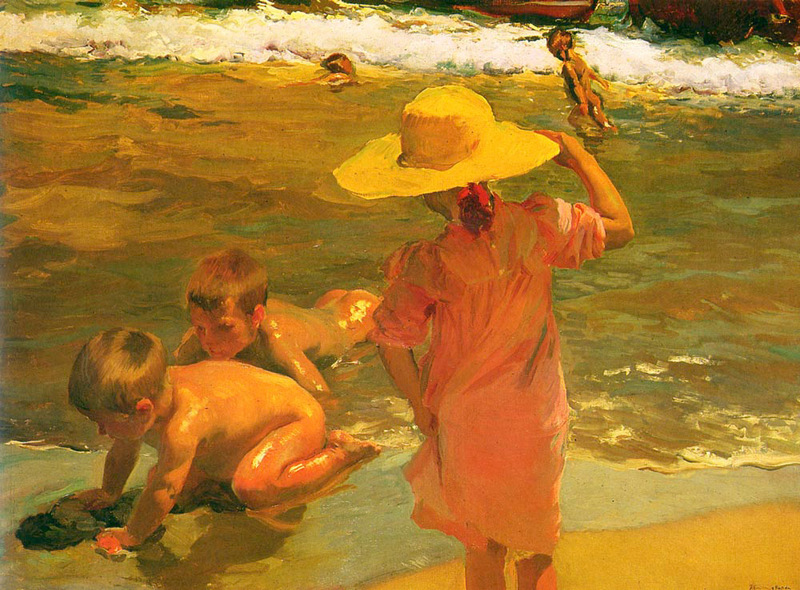 Sorolla has that special gift of being able to put warmth and sunshine into his paintings. 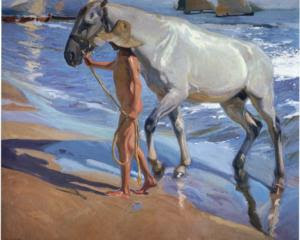 In the painting of the boy and horse emerging from the sea you can positively feel the heat of the sun. A painter unknown to me too, you have a talent for revealing artists that we should be acquainted with - thank you. Love his art. Thanks for this info. I myself have never seen his work. You always have such an interesting post. Thank you for introducing me to yet another great artist. I've never seen his works, as far as I know, and did not know his name. Some of his paintings remind me of Sargent and others of Winslow Homer, two of my favorites. 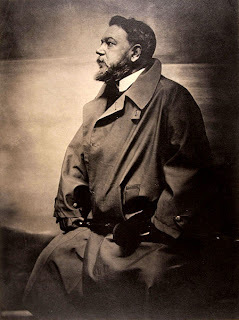 Now I can add Sorolla to the growing list. I like Sorolla's work very much. 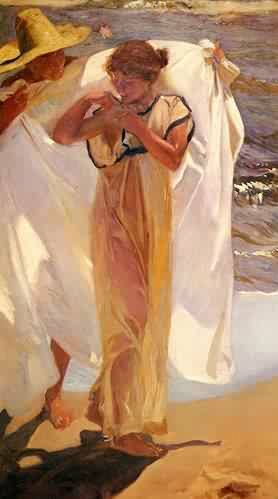 I have a special admiration for artists who are able to capture the essence of light, and Sorolla was certainly a master in that regard. 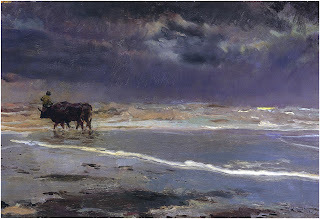 His compositions are also very bold, and the combination of the two make his work appear more modern than his own time. I agree, Jane and Lance. As I said, I'd never heard of him until recently. It's a shame, really. He really does deserve to be mentioned along with Sargent and the rest of that group. You're welcome, Rick. He was a really prolific artist, so there's plenty of his work to enjoy. I think if he'd been French or English he probably would be much better known. 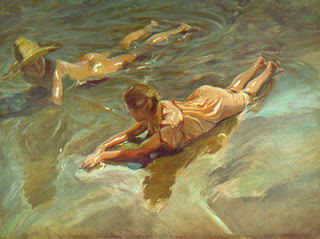 Kathy, I hope you'll check out the links and see more of Sorolla's work. He truly was a painter who deserves much more renown. It's amazing to me how many wonderful artists have either been forgotten or just plain ignored by history. 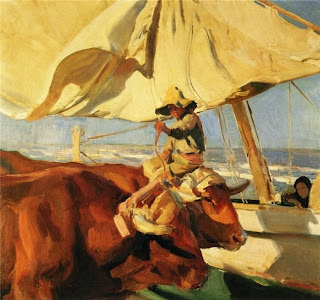 Thank goodness for the internet - without it, I doubt I'd have come across Sorolla's work. Thanks, Yvonne. 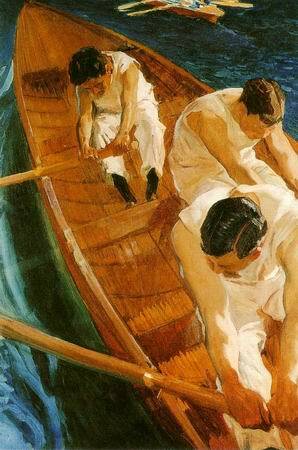 I'm glad you enjoyed Sorolla's wonderful work. You're welcome, Joan. Sorolla is clearly as good as some of the top names working near the end of the 19th century and into the 20th. He really does deserve to be better known and I'm sure those in the art field - collectora and dealers and such - are very familiar with his work. I agree, Mark. His work stopped me in my tracks as I was looking around at various artists wondering who to write about next. I wish I knew just how exactly these Impressionist painters were able to capture light in such a stunning way. Part of their genius and training, I suppose. But it must also have something to do with how they 'saw' the world.